O God, who constantly raise up in your Church new examples of virtue, grant that we may follow so closely in the footsteps of the Bishop Saint Alphonsus in his zeal for souls as to attain the same rewards that are his in heaven. Through our Lord Jesus Christ, your Son, who lives and reigns with you in the unity of the Holy Spirit, one God, for ever and ever. St. Alphonsus de Liguori was a great preacher of the Gospel to the poor. His charity and apostolic spirit led him to found the Congregation of the Most Holy Redeemer to carry on this work. He sent his Redemptorists, as our Lord did the Apostles, into the countryside and the market towns and villages, to announce the Kingdom of God. He became Bishop of Sant' Agata dei Goti, near Naples, and died at the age of ninety, in 1787. For his great works on Moral Theology he has been declared a Doctor of the Church. According to the 1962 Missal of St. John XXIII the Extraordinary Form of the Roman Rite, today is the feast of St. Peter's Chains. It celebrates the dedication of the basilica of St. Peter ad Vincula in Rome which was built in about 432 on the Esquiline Hill in Rome and consecrated on August 1. It is also the commemoration of the Holy Machabees. The seven Machabees were brothers martyred with their mother under Antiochus Epiphanes in about the year 150 before Christ. There is an account of their wonderful death in the Old Testament. Their relics venerated at Antioch in the time of St. Jerome, were translated to Rome in the sixth century, to the church of St. Peter's Chains. 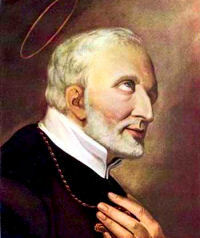 Alphonsus Liguori, born in 1696, was the son of an ancient Neapolitan family. His father was an officer in the Royal Navy. At the age of sixteen, Alphonsus received his doctorate in both canon and civil law and for nearly ten years practiced at the bar. When he found that one of the legal cases he was defending was not based on justice but on political intrigue, he gave up the practice of law and dedicated his life to God. Ordained to the priesthood in 1726, St. Alphonsus Liguori joined a group of secular priests dedicated to missionary activities. He involved himself in many kinds of pastoral activities, giving missions and organizing workers, and had a part in the founding of an order of contemplative nuns. In 1732, he founded the Redemptorists, a congregation of priests and brothers, to work especially among the country people of Italy who often lacked the opportunity for missions, religious instruction, and spiritual retreats. Strangely, his first companions deserted him; but Alphonsus stood firm, and soon vocations multiplied and the congregation grew. The Redemptorists were approved by Pope Benedict XIV in 1749, and Alphonsus was elected superior general. In 1762, he was appointed bishop of Sant' Agata dei God and as bishop he corrected abuses, restored churches, reformed seminaries, and promoted missions throughout his diocese. During the famine of 1763-64, his charity and generosity were boundless, and he also carried on a huge campaign of religious writing. In 1768, he was stricken with a painful illness and resigned his bishopric. During the last years of his life, problems in his congregation caused him much sorrow and when he died on August 1, 1787, at Pagani, near Salerno, the Redemptorists were a divided society. He was beatified in 1816, canonized in 1839, and declared a Doctor of the Church in 1871. Patron: Confessors; final perseverance; theologians; vocations. From the Catholic Culture Library: Habits of Holiness by Vito Lombardi. There in some controversy as to whether St. Peter's chains were brought from Jerusalem by Eudoxia in 439, or by some travellers sent to the East in search of them by the martyr St. Balbina and her father, St. Quirinus, in 116. Gerbet defends the latter opinion and says St. Balbina gave them to Theodora, sister of St. Hermes, martyr, Prefect of Rome, from whom they passed into the hands of Pope St. Alexander I (108-117). St. Bede the Venerable, writing in the seventh century, speaks of the chains in connection with St. Balbina and St. Alexander. Such was the reverence paid to these chains in the fifth and sixth centuries, that filings of them were considered precious relics suitable for kings and patriarchs, these filings being usually enclosed in a gold cross or key. Such a relic was sent by Pope St. Hormisdas to the Emperor Justinian; by St. Gregory to King Childebert, to Theoctista, sister of the Emperor Mauritius, to Anastasius, Patriarch of Antioch, and others; by Pope Vitalian to Oswy of Northumbria; by St. Leo III to Charlemagne; by St. Gregory VII to Alphonsus, King of Castile. These crosses and keys were often worn around the neck as a preservative against dangers, spiritual and temporal. St. John Chrysostom's words on St. Paul's chains apply equally to St. Peter's: "No glittering diadem so adorns the head as a chain borne for Christ. Were the choice offered me either of heaven or of this chain (suffered for Christ), I would take the chain. If I might have stood with the angels above, near the throne of God, or have been bound with Paul, I should have preferred the dungeon. Had you rather have been the angel loosing Peter, or Peter in chains? I would rather have been Peter. This gift of chains is something greater than power to stop the sun, to move the world, or to command the devils" (Homil. 8, in Ephes iii. I.). Excerpted from Pilgrim Walks in Rome by P.J. Chandlery S.J. This day still is known in English-speaking countries as Lammas Day, or loaf-mass day. This was the festival of the first wheat harvest of the year, on which day it was customary to bring to church a loaf made from the new crop. In many parts of England, tenants were bound to present freshly harvested wheat to their landlords on or before the first day of August. In the Anglo-Saxon Chronicle, where it is referred to regularly, it is called "the feast of first fruits." The blessing of new fruits was performed annually in both the Eastern and Western Churches on the first, or alternately the sixth (Transfiguration), of August. The Sacramentary of Pope Gregory I (d. 604) specifies the sixth. Excerpted from The Stations of the Sun, Ronald Hutton, Oxford 1996. Patron: Andrate, Italy; diocese of Annecy, France; Donnas, Italy; diocese of Cincinnati, Ohio. The chains in the Church of St. Peter in Chains in Rome are said to be two sets of chains from both times of St. Peter's imprisonment, in the Mammertime Prison and the chains from Jerusalem when the angel released him. Read the account in Acts 12:1-19. For this traditional "first fruits" of the wheat harvest thanksgiving feast, bake some bread. The cathedral for the diocese of Cincinnati is dedicated to St. Peter in Chains. This cathedral was first dedicated in 1845, with some restoration and renovation in the 1950s. It is a beautiful church to visit if you are ever in the area. The seven Machabean brothers, together with their mother, were martyred about the year 164 B.C. by King Antiochus Epiphanes. The mother in particular deserves to be admired for the heroic fortitude with which she encouraged her children to suffer and die. Their remains were venerated at Antioch. After the church which was built above their resting-place was destroyed, they were taken to Rome; during the renovation of the high altar of St. Peter in Chains (1876), a sarcophagus dating from the fourth or fifth century was found; lead tablets related the relics to those of the Machabean martyrs and their mother. Seldom does it happen that the Roman Church venerates Old Testament saints in the Mass and Office; it is much more common in the Greek rite. Martyrdom before the advent of Christ was possible only through faith and hope in Christ. Today's feast is among the oldest in the sanctoral cycle. In the second Book of Machabees, sacred Scripture recounts the passion and death of the Machabees in a very edifying manner. St. Gregory Nazianz discusses why Christians honor these Old Testament saints: "They deserve to be universally venerated because they showed themselves courageous and steadfastly loyal to the laws and traditions of their fathers. For if already before the passion of Christ they suffered death as martyrs, what heroism would they have shown if they had suffered after Christ and with the death of the Lord as a model? A further point. To me and to all who love God it is highly probable that according to a mystic and hidden logic no one who endured martyrdom before the advent of Christ was able to do so without faith in Christ."